SUPERIOR -- Three potential saints of the Catholic Church have made an impact on many people of the Diocese of Superior. They include the Venerable Fr. Solanus Casey, OFM, Bishop Frederic Baraga and Blessed Kateri Tekakwitha. Venerable Fr. Solanus Casey, OFM, was born Bernard Casey in 1870 in Prescott, Wis. His family relocated near Hudson and at the age of 13 Casey made his first Communion at St. Patrick Church in Hudson. Br. Leo Wollenweber, OFM, in Detroit, is vice postulator of Casey's sainthood cause. Wollenweber said his work involves collecting materials on Casey for the Vatican's Congregation for Sainthood Causes. Wollenweber personally knew Solanus, residing with him from 1941 until 1945. "I was his secretary," he said. "I was in Detroit, in 1957, when he died. His funeral was a tremendous outpouring of people. We estimate that there were 20,000 people that paid respect to him. Our church is small and many of the people stood outside during the Mass." Wollenweber called Casey a gentle man. "He was very easy to talk to and was always interested in people," he said. "He never hurried anybody, even though there may have been 20 people waiting to see him." According to Wollenweber, Casey often spoke with the friars about his time living in the Superior diocese. "It was an important part of his life," he said. At an early age, Casey had to go to work in order to help support his family. It was during his time as a streetcar motorman in Superior that Casey witnessed a stabbing. "That scene of violence made such an impression on his life that he wanted to do something better with his life," Wollenweber said. "That's when he decided to try for the priesthood." The priest at St. Francis Xavier Church in Superior recommended that Casey attend St. Francis Seminary in Milwaukee. "But he found it difficult," Wollenweber said. "(He spoke English, but) all the studies were in German." After five years in Milwaukee, Casey joined the Capuchin order in 1896. He was ordained at St. Francis Church in Milwaukee, July 24, 1904. Br. Richard Merling, OFM, director of the Father Solanus Guild, said the guild was formed in 1960, three years after Casey's death. "People wanted to keep his spirit alive," Merling said. "People visited his grave after his death and their prayers were being answered." By 1965, Capuchins officially began Casey's cause for canonization. "The Capuchins made the request to Rome," Merling said. "In the meantime, information was collected and people told stories of their experiences of knowing him." In 1995, after approval of documentation and other information, the Vatican declared Casey Venerable. This is two steps away from sainthood. Wollenweber said Casey needs a miracle attributed to his intercession in order to become a saint. "We have had several cases reported to us, but they haven't been approved by the doctors that work with sainthood causes," he said. "We have a couple more over there that are under study at this point. We are optimistic. We hear on a daily basis of those impacted by Solanus. We get letters and phone calls. It's not a rarity, but it is a daily occurrence of people telling us about these things." Some five years ago, a group from St. Patrick Parish in Hudson developed a play on the life of Casey. In June, the production, written and directed by Molly Delaney Druffner, came to Superior. Deacon Peter Braam, who became acquainted with the life of Casey in the early 1970s, was battling cancer when he started playing the part of Casey. He said the support and prayers of the cast helped him get through his illness. "Even though I wasn't feeling well, it felt right to take on the part," Braam said. "I like Fr. Solanus and I have grown close to him because of the play. I feel humbled to play the part of a man that clearly demonstrated heroic virtue. He met thousands of people. I have worked with people as a social worker. It's not easy, but he always found time for people and gave them a gift of hope. He was very close to God." Bishop Frederic Baraga was born in Slovenia in 1797 and was ordained a priest in 1823. In 1830, Baraga left his native land for the United States, devoting 36 years, the rest of his life, in the Indian missionary field of the Upper Great Lakes. One of Baraga's five Indian missions on Lake Superior was among the Chippewa on Madeline Island, at La Pointe, where he arrived July 27, 1835. He ministered there for about eight years, baptizing 981 people. He went on to become the first bishop of Upper Michigan. Baraga died in 1868 in Marquette, Mich. Since 1930, the Bishop Baraga Association has been promoting Baraga's cause for canonization. The organization says it strives to make the example of his love of God and service of his neighbor known to all people. It holds an annual Baraga Days each year to celebrate the life of the man known as the "snowshoe priest." Fr. Alex Sample, a priest of the Diocese of Marquette, Mich., who serves as executive director of the Baraga Association, announced during last year's Baraga Days that a potential miracle being attributed to Baraga was in the early stages of investigation. The Marquette diocese is now putting the finishing touches on their investigation. "This will give Rome a chance to look at this potential miracle," Sample said. "I would expect that to go in a month. Then, we wait to see if Rome thinks it is worth pursuing." If it is deemed worthy of further investigation, Sample said, an official tribunal would be set up in Marquette to look at this potential miracle even more intensely. "Once a judgment is given (by the tribunal), it would go back Rome for a final judgment," he said. "The Congregation for Sainthood Causes would then verify the miracle and the Holy Father would officially declare it." Currently, a miracle remains the key for its advancement of the Baraga cause. Sample cautioned that there are many other potential sainthood causes currently under investigation in Rome. They are included on two lists. On one list are those causes with a miracle and on the other list are those that do not have a miracle. "We won't move along like those that do have a miracle," he said. One person who spread the word of Baraga to others during her time in the Superior diocese is Sr. Genevieve Schillo, a Sister of St. Joseph, who served the diocese for many years and recently moved to St. Paul, Minn. Schillo has written a number of research papers and organized events relating to Baraga's life. Among the items she developed was a map showing Baraga's travels on land that now is part of the Superior diocese. "Baraga was a very bright man," Schillo said. "He was so unusual. He not only wanted to teach them (Native Americans) the Christian faith, but he wanted to teach them to read. He always received the Indians in a very positive manner and he was able to learn their language." Because he sought to raise the standard of living for Native Americans, Schillo called Baraga one of this country's earliest social reformers. "He came to realize very early on that the Indians had to travel great distances in order to trade their furs," she said. "The traders took their furs and paid them in bad alcohol. This made the Indians sick and they became hooked on alcohol." Schillo said she suspects that Baraga not only traveled the shores of Lake Superior, but also traveled into other parts of the diocese, although there is no documentation. "He may have been farther south," she said. "He could have taken the same trails or followed the rivers, like other missionaries did." Schillo said Baraga is worthy of sainthood because of the daily struggles that he faced in order to spread God's word. "People hold him as a very holy model," Schillo said. "He endured a lot and anybody that could do the stuff that he did must be pretty darn unusual." 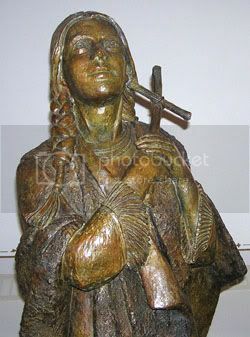 Tekakwitha was born in an area that is now known as the state of New York. Her father was a Mohawk chief and her mother was a member of the Algonquin tribe. "Her mother was Catholic, but her father wasn't," said Sr. Kateri Mitchell, SSA, executive director of the Tekakwitha Conference National Center in Great Falls, Mont. "Most of the people in the Mohawk villages followed the traditional Iroquois ways." When Tekakwitha was 4 years old, a smallpox epidemic attacked the people in her village. It took the lives of her parents and a baby brother, leaving her an orphan. Although forever weakened, scarred and partially blind, Tekakwitha survived. When Tekakwitha was about 18, Mitchell said, a Jesuit missionary established a chapel in her village. She was baptized, despite the protests from her relatives. Tekakwitha left her village shortly after this, fleeing more than 200 miles to the Catholic mission of St. Francis Xavier at Sault Saint Louis, near Montreal. "She met up with other Christian Mohawks," Mitchell said. "She was able to practice the faith and was free of her previous burdens." Tekakwitha devoted her life to prayer. "She had her own ministry," Mitchell said. "People were healed through her. She was a catechist among her own people. She taught the children about the Catholic faith, about prayer and about God." Poor health, which had plagued her throughout her life, led to Tekakwitha's death. Known as the Lily of the Mohawks, Tekakwitha is the first Native American woman to be considered for sainthood by the Catholic Church. On Jan. 3, 1943, Pope Pius XII declared Tekakwitha Venerable and on June 20, 1980, Pope John Paul II beatified her. In keeping with the wishes of the Bureau of Catholic Indian Missions, members of parishes in the diocese with a significant number of Native American parishioners help spread the word about Tekakwitha. St. Anthony Parish in Lac du Flambeau celebrated a Mass in honor of Tekakwitha on July 17. St. Francis Solanus Parish in Reserve is home to a Kateri Circle. This is a group that is charged with promoting Tekakwitha's cause and these circles can be found throughout the country. St. Mary Parish in Odanah and St. Francis Parish in Red Cliff also honored Tekakwitha during special Masses. Sr. Felissa Zander, SSSF, and Rita Corbine, both members of the Reserve parish, attended the 66th annual Tekakwitha conference, July 20-24, in Tucson, Ariz. The theme of this year's conference was "Blessed Kateri Bearer of Spiritual Rain to the Mountains, the Deserts, and to all Nations." Zander, who serves as principal at the parish school, has attended a number of these national conferences. "I have not missed any since 1990," Zander said. "The conference is a time to promote Blessed Kateri and a chance for people to be made more aware of her wonderful life." Time was set aside at the event for prayer, including a rosary by candlelight. "Yaqui tribal members danced the rosary," Zander said. "That was most impressive." Zander is among those in the Superior diocese praying for Tekakwitha's eventual canonization. "One more miracle is all she needs to become a saint," she said. Fr. John J. Paret, SJ, is vice postulator of Tekakwitha's sainthood cause. Paret, of Auriesville, N.Y., confirmed that a "canonical investigation" would begin soon. "This is an investigation of a possible miracle," Paret said. "I have to keep the details of this investigation a secret in order not to jeopardize it. But the fact that we are going to have this investigation is an encouraging sign. This is the last step needed for sainthood." Zander said Tekakwitha is an important figure for the diocese. "She is important for everybody," she said. "She was such a simple person. Since 1980, when Pope John Paul declared her Blessed, she has become well known among the Native Americans." Mitchell said, "People of many cultures have come to know about her. They have found something that is spiritual about her. She embraced the Catholic faith, even at a time that it wasn't well known. for their generous permission to reprint this article.